This charming, nicely furnished and well-equipped detached house retains a feature fireplace and exposed oak beams. Set in large. 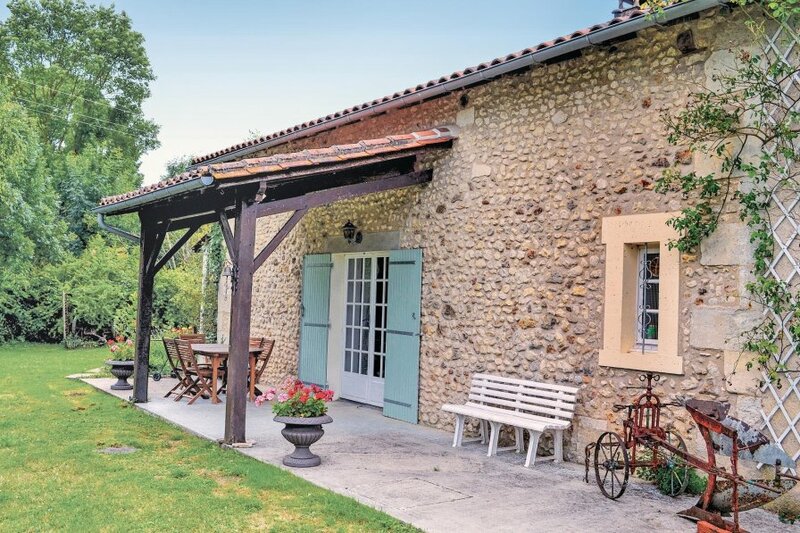 This charming, nicely furnished and well equipped detached house is typical of the region, it retains a feature fireplace and exposed oak beams. Set in large, fully enclosed private gardens with a covered terrace area to the front of the house that overlooks the gardens and the private swimming pool (available June to mid September).You can enjoy the peace and quiet of the small hamlet in the knowledge that a short drive in any direction there are popular and interesting places to visit.The busy market town of Riberac is approximately 7km, the pretty villages of Aubeterre and St. Aulaye are less than 15km. The popular fishing/swimming lake of Grand Étang de la Jemaye, with a sandy beach and children's play area is approximately 10km.Shops and café/bars 7km, restaurant 800m. The agent has rated it as a four star property so it is a well-equipped villa with above average furnishings. It is also great value for money. This villa has a private pool and is located in Vanxains, only 7km from Riberac. It is set in a good location: there is a restaurant only 800 metres away. The villa has free wireless internet. You can also park on-site at no extra charge. The villa is well equipped: it has a refrigerator, microwave and washing machine. It also has a barbecue, a garden and some garden furniture outside.